If the Semi-final was spectacular, the Final was in a league of its own. This morning the eight female finalists lined up for the third day running, intent on giving it all they had left. The problems proved to be hard though, with just one top at the hands of Kristen Buchmann from Germany. This wasnt enough however to beat Ksenia Sdobnikova, consistent on all three problems and now, after her victory in Kirov, well ahead in the provisional IWC ranking. The Mens Final got underway at 12.30 precisely. And it was Daniel Dulac who stole the show, climbing to victory once again although the Frenchman was the only athlete to top out on the first route, any of the finalists could have won the competition. 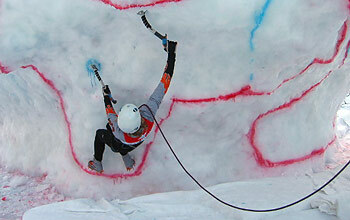 In the end Will Gadd, perhaps the only true ice climber and much to his own surprise, placed second, ahead of the Austrian Harald Berger, strong and determined as ever. Evgeny Krivoisheitsev placed fourth followed by Husson, Bytchkov, Lombard and Steinbrugger, fifth to eigth respectively. Three days of spectacular competition now come to an end in Valle di Daone. The event proved to be entertaining for all and extremely well run  from the creation of the ice structure to the setting of the routes, not to mention the organising committee and the countless volunteers  congratulations to all who helped make Daone work. 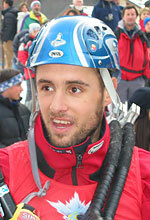 Daniel Dulac, winner of the second stage of the IWC 2002 in Valle di Daone.